Micromanaging for Success: What’s Your Style? During this time of technological change, what does the future work force look like? What is the most important quality to look for when hiring? Who will be best suited to carry the organization into the new smart machine age? The Center for Logistics Innovation, which is part of State of Georgia, puts together the summit. The Center is based out of same building where the Advanced Technology Development Center (ATDC), which is like Y-Combinator in the South. That makes it much easier to collaborate with State sponsored organizations spearheading the initiative. Normally, state-sponsored organizations have a reputation for being slow and redundant with bureaucracy. However, the organizations and the folks I have worked with are a complete opposite. The vision has achieved highly-structured coordination across multiple different state sponsored organizations. A myriad of networking events happen to help build both formal and informal relationships among them for much higher effectiveness. The people involved in the state program have done an amazing job. 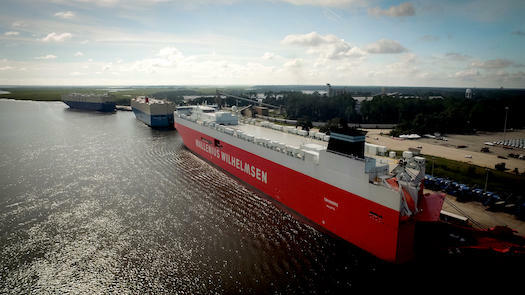 For example, the Port of Savannah is the fourth largest port in the United States in terms of container traffic (after Port of Los Angeles, Port of New York and Port of New Jersey). The Port of Montreal Canada is building best practices, procedures, processes, infrastructure and many other things, modeling them based on the Port of Savannah. On top of that, Atlanta is a major hub for distribution centers for many companies that hit the Port of Savannah. The State of Georgia has fostered all this growth with several strategic projects such as the major high way that is being constructed in the North of Atlanta along with a major stadium, which is creating so many employment opportunities in that area. So, let’s get back to the questions above. Nobody can deny that we are at the cusp of major technological changes. The old ways of doing business are changing. Both the internet and mobile technology have completely changed the rules of the game. The next five to seven years are going change things even more. Consider the variety of disruptive technologies on the horizon: self-driving cars, smart and connected devices, new delivery models, artificial intelligence, machine learning, and predictive analytics. Based on all of this, we are due for big changes. Thirty years ago, we defined intelligence based on the ability to remember facts and figures. Now, with Google, you really don’t need to remember much. You can be as smart as anyone else if you have a mobile device and can figure out the right question quickly. With that change, the smartest person has been the person who can discern quickly which information is most accurate and authentic. With new disruptive technologies, the ability to do complicated analytical thinking has become less important, because we have tools and technology to achieve these processes more accurately and efficiently. That begs the question: How will we define intelligence going forward? I suspect that it will be the person who can quickly adapt to change. Smart people will be the ones who one that can learn new tools fast, and produce measurable results quickly. Smart people will be those who can be lifelong learners. Agility will be a critical quality for the future workforce. I was surprised to learn that the new breed of recruiters are specializing in evaluating such agility of humans with specialized tests and interview processes. They are evaluating humans on their potential to change. Another complexity that is changing the workforce, especially in distribution centers, is automation. Rote jobs are going to robots, so humans will have to do the jobs that are complicated, analytical, and involve a lot of decision making that may involve emotional aspects. Simpler tasks will leverage artificial intelligence, machine learning and analytics. That will shift the role of the workers, who will take on the complicated and strategic tasks. So, let’s talk about the changes. How have you fostered agility in your organization? How are you preparing your work force to usher it into this smart machine age? What are some of the best practices you have incorporated in your hiring process? Let us know your thoughts in the comments section below.